If you have stumbled across this site because you were browsing historical topics, at some point you likely have come across references to school children using slates to perform their work. We all know (somehow, by osmosis perhaps) that a slate is a chalkboard. But, who exactly knows the how and they why of the slate? Many sources reference the fact that paper was expensive while slate was inexpensive. Now that really turns our modern concept of school supplies on its head, doesn’t it!? But, in perspective, a slate was a one-time purchase, and for practicing at something such as penmanship or arithmetic, it wasn’t practical to keep the work. Paper would have been reused to start the fire. Slate is a type of stone you might have seen used as stepping stones or patio paving, but in the 19th century, the stone was “flaked” into thin sheets and then cut to size. The average size was 8×10 once encased in the frame. Slates could be bound in a book to protect the surface, and smaller 3×5 slates were available for adults to jot notes and work math on. Both sides of the slate would have been used as a work surface. School children had a slate which they carried back and forth from home to school. But, what did they write with? Until recently, I assumed “chalk of course!” because that is what the teachers of my childhood used on the chalkboard. But! that was not the case in the 19th century. 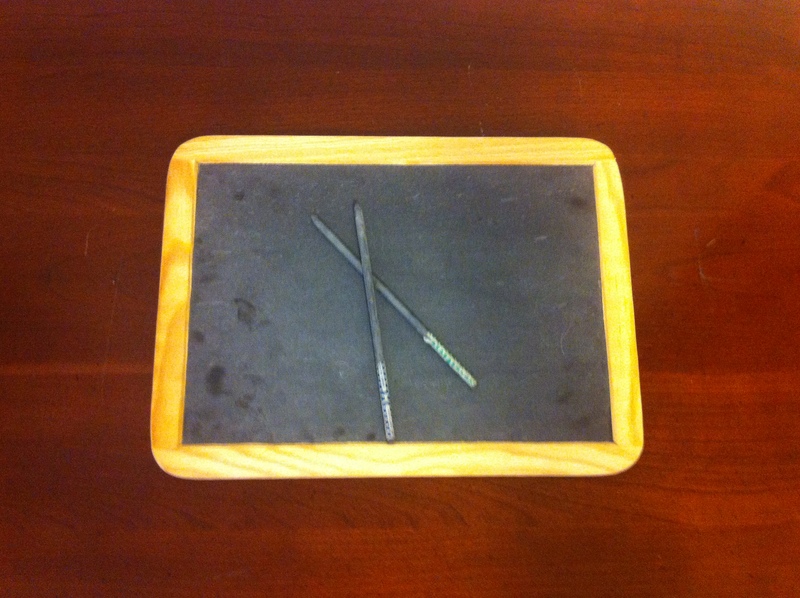 Slate pencils were most common, and made from soapstone or of a softer grade of slate than the actual tablet was made. They were commonly wrapped in paper and slate pencils wrapped in wood (akin to a modern #2) were also available into the 20th century. The softer the pencil, the fewer scratches it made into the slate surface, preserving the slate for a longer amount of usage. Chalk was also available which was softer and easier to write with on slate. If you don’t like the sound of nails on a chalkboard, plug your ears when learning to write with a slate pencil on a slate! The scratching sound is something like a cat catching its tail under a rocking chair’s runner. The slate was phased out in the 20th century as paper making became less expensive. They are still widely available on auction sites like ebay where you can get an antique slate and the pencils, but don’t look for them at you local craft store because they are no longer the “in thing” to decorate apparently. The ones you might find there would be chalkboards rather than slates anyway – particle board painted with chalkboard paint rather than an actual piece of slate. While researching for this article I found the following history sources, although I know nothing about them and this is not an endorsement. My friends and I will be visiting Huntington Beach’s annual Civil War event this Labor Day weekend. Hope to see you there! This entry was posted in Other, Victorian and tagged back to school, chalkboard, education, school, slate, slate pencil, tablet, victorian education. Bookmark the permalink. Hello, may I use your photo posted on this page? I am doing a presentation on the history of the pencil. Hi Evonne- if you would, please give a link back to this page. Sure that’s no problem at all. I have enjoyed visiting your site. I have joined a local group who restored a one-room school house. I would like to see more items that kids can touch, such as slates and various games. I can’t wait to share your website.